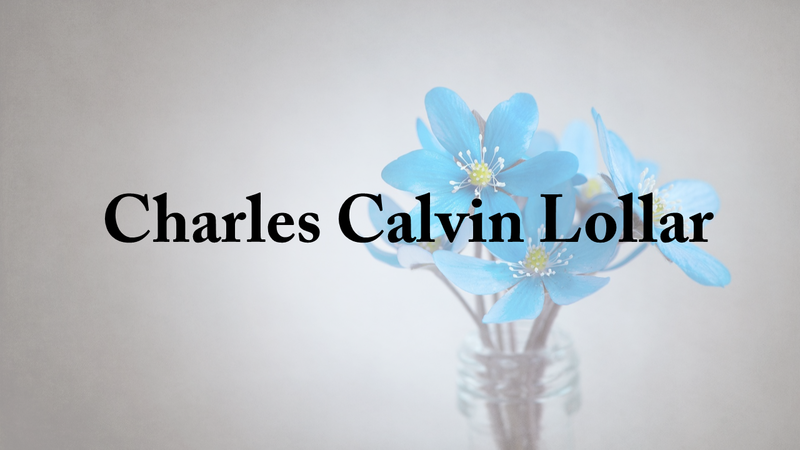 Charles Calvin Lollar, 91, made his final journey home on January 19, 2019. He was born on April 12, 1927 to Fred and Lucy Lollar in Flat Creek, Alabama. He retired from the United States Navy at the rank of Chief Petty Officer and served during World War II, The Korean War and completed three Mediterranean cruises in service to his country. Mr. Lollar was preceded in death by his parents and his son, Chuck. He is survived by Jean, his wife of 68 years, daughters Rebecca Reeves (Richard), Beth Chandler (Anthony), and Jill Lollar (Mel), six grandchildren, Rebecca, Elizabeth (Jason), Sarah, Michael (Arianna), Stephen (Emily), and Ashleigh, and five great grandchildren, Hannah, Drew, Max, Emma and Levi. A private graveside service and military ceremony was held on Monday, January 21 at Fairview West Cemetery in Hanceville. In lieu of flowers donations may be made to a favorite charity. Hanceville Funeral Home directing.